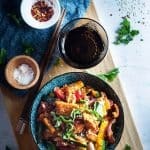 You need to try this Spicy Salmon Stir fry that is bursting with umami flavour and texture that will get your tastebuds up and dancing. 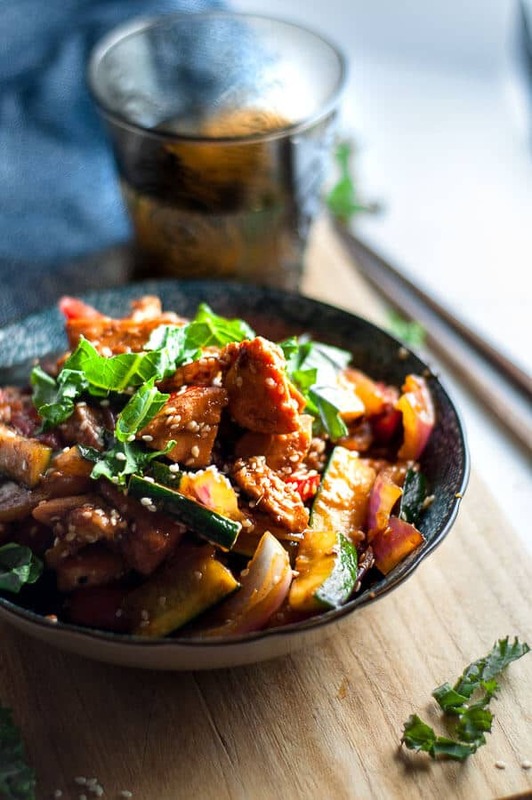 Fresh, spicy, and zesty this is an Asian inspired dish with an almost Mexican influence. It’s prepared with fresh ingredients, is easy to make and tastes much more complex that it actually is. In case you’re wondering, Umami is a fancy Japanese word for rich, balanced and well rounded. Yep, that’s this dish to a T.
I used fresh salmon (skin off) for this recipe which I think is a must. Start with a couple of salmon portions, patted dry to remove the moisture and cook them in a frypan/skillet on a high heat for about 5 minutes one side, then 3 minutes the other side. Next, comes the fun part. Using a spatula or egg flip, roughly chop the salmon into pieces whilst it is still in the pan so it can crisp up even more so that you end up with a combination of soft and crispy salmon pieces. Getting the salmon right is the biggest challenge with this dish and I particularly love the extra brown crunchy bits that form on the bottom of the pan. I use the spatula to scrape these off and mix into the salmon for extra colour and flavour. 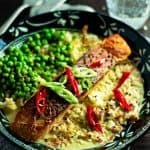 You’ll need a combination of sweet, salty, bitter and savoury. Keep it as simple as possible. Anything green and leafy, such as kale, spinach leaves or bok choy, and capsicum/peppers and shallots also work really well. I also like to use chunks of red onion to add an extra layer of sweetness. Fresh salmon will get you the best crispy and crunchy version of this dish. Try to avoid using canned salmon, you’ll likely be disappointed. Cook the salmon first and get it crispy and crunchy, and set it aside whilst you work on the sauce. Use the Siracha hot sauce sparingly, unless you have an extra high tolerance for spiciness. A little goes a long way. Use a frypan/skillet for the salmon and a wok for the vegetables and to finish bringing it all together. Don’t dump all the ingredients into the wok at once and attempt to make it into a stirfry. You won’t get the crispy salmon effect and you’ll end up with some things undercooked and other thigs overcooked. Because this dish is so spicy and full flavoured I like to pair it with a glass of big bold red, like a shiraz. I typically like to stick to drinking Australian wines and really enjoy Shiraz from the Hunter Valley regions in New South Wales, and the Barossa in South Australia. 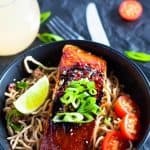 Looking for other salmon recipes: try this delicious Salmon Burrito Bowl, or how about Chilli Soy Salmon with Sesame Noodles, or my no fail Salmon Curry In A Hurry. 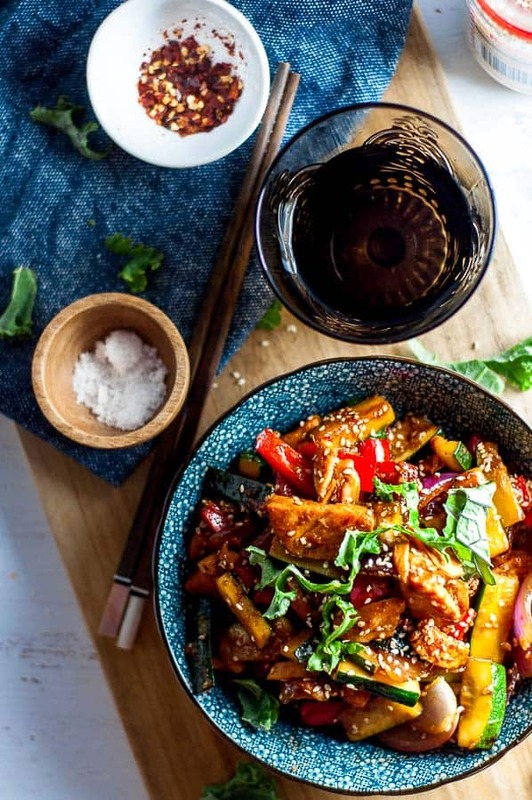 Hubby and I are off to Adelaide in a weeks time where we have a few Japanese restaurants earmarked to try, along with of course some Barossa Valley Shiraz which I’m very excited about. This is our 5th trip to a well known Australian wine region and along with the Barossa, north of Adelaide, we’re also going to be taking in some wineries in McLaren Vale, which is to the south of Adelaide. It’s all very timely, since our Vintec wine fridge is verging on empty with only the very rare and expensive bottles left that we have deemed should be consumed for “extra special” occasions, like anniversaries and birthdays. Stocking up on good quality all occasion wine will be one of our focuses and we plan on buying plenty of cellar only wines that you can’t buy from bottle shops or Liquor Marts. I guess we’d better break out the piggy banks and round up our loose change. We’re going to need it. And I’m sure we’ll be tempted to sneak in a bottle or two of some high end stuff based on past experience….on second thoughts, we might need to raid our savings! 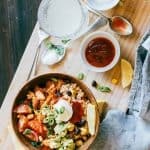 Afresh, spicy, and zesty Asian inspired dish with an almost Mexican influence. It’s prepared with fresh ingredients, is easy to make and tastes much more complex that it actually is. Prepare the marinade for the salmon. In a small bowl add 1 tablespoon soy, I tablespoon crushed garlic, 1 teaspoon of siracha hot chilli sauce and half the juice of an orange. Add salmon to the marinade and coat. Leave for 5 minutes at room temp. Prepare the stirfry sauce. In a small jug/bowl, add all of the sauce ingredients and whisk together. Heat a work on medium high heat, and add the salmon. Use a silicone or wooden spoon to stir about until cooked through. Be gentle with it – as the salmon cooks it will become more delicate. Generally about 5 minutes is enough. Take the salmon out of the wok and put on a plate to the side. To the wok, add ½ cup of water, and the vegetables. Use the same spoon to toss them about in the wok until the water evaporates. Once water has evaporated, add the salmon back in, along with the stirfry sauce. Stir through for 1 minute then remove from heat. Serve on it’s own, or for a larger meal add a side of steamed Jasmine rice or brown rice. I recommend starting off the with above amounts of Siracha hot chilli sauce as this provides a warming medium heat. If you are used to something hotter, add some more at the end, very gradually as this is a very hot sauce and you only need a little it to make a big impact. 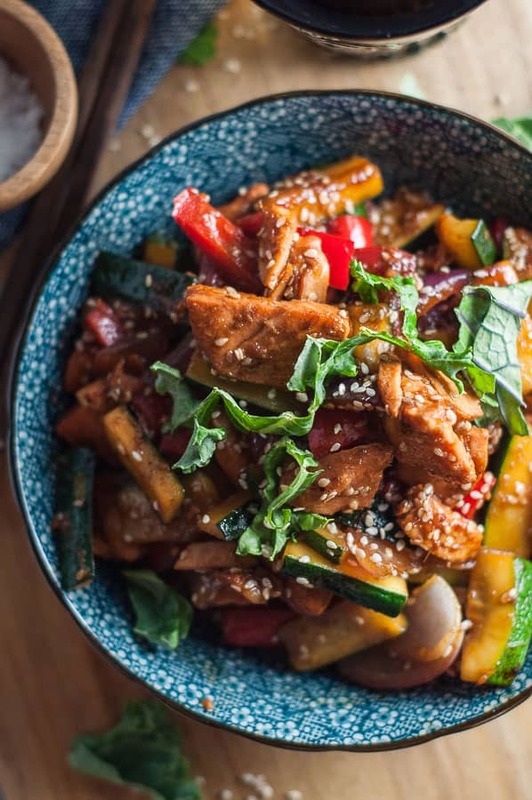 Another way I have enjoyed this dish is by just marinating and cooking the salmon, adding a bunch of kale and spinach leaves to the wok, heating through, and then adding the stirfry sauce with 1 cup Jasmin rice – Salmon, Kale and Rice Stirfry. Just as good, and just a little bit less work as you don’t have to chop the veges. Yep! It was easy to make and very tasty. What a quick but delicious meal. Served with rice. Loved the spice. Thank you for sharing.